We would like to help make your experience in the redwoods as rewarding as possible. We offer several retail outlets within park visitor centers stretching from Eureka, California all the way up to Crescent City, California and east to Gasquet, California. Click on the logos below to learn more about each of the parks Redwood Parks Conservancy partners with. Please feel free to contact us for further information. We hope to see you soon. 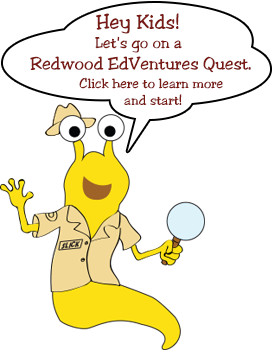 While visiting the parks of the Redwood Coast, take your children on a Redwood Edventures Quest! Great fun, educational, and you can earn a unique patch for every Quest you complete!